It is such an honor to be hosting my first guest blog post by The Katherine Martinelli. If you knew Katherine, you would be in complete agreement that she must only be called The Katherine Martinelli, as only so grand a name would do her talents, beauty inside and out, and incredible generosity justice. About a year ago when I decided to really make a go of this food writing business, a friend suggested I reach out to Katherine. “She’s making it…she’s really making it,” our mutual friend Julia boasted to me. And so with slight nervousness and trepidation I emailed Katherine, who was and is currently residing in Israel. Bounding back across the interwebs came her reply, full of wisdom and grace, encouragement and confidence. It was exactly what I needed at that moment, and so buoyed by her success and her passion, I jumped in. Shut Up & Cook would absolutely not be where it is today, without Katherine and her endless guidance and positivity. 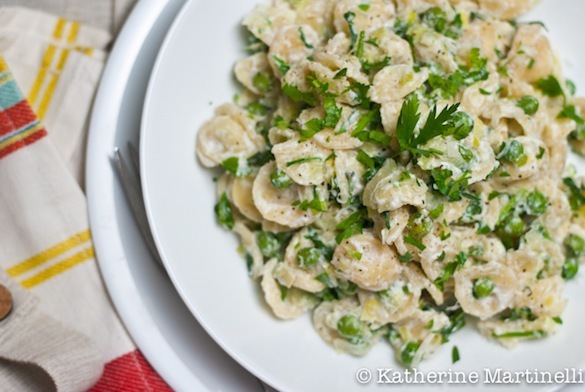 And so with no further ado, I introduce you to The Katherine Martinelli and her delicious Orecchiette with Leeks and Ricotta. I can’t tell you how thrilled I am to be guest posting on Shut Up & Cook | The Attainable Gourmet. Erina and I have known each other since college, but I don’t think that back then either of us could have guessed at the other’s budding culinary dreams. Although we haven’t seen each other in many, many years it’s been amazing to reconnect virtually through our blogs and shared love of food. I love Erina’s easy-elegant style (which is so perfectly summed up in her new tagline – The Attainable Gourmet) and knew I needed to offer a recipe to match. This pasta dish certainly fits the easy bill – it can be ready in less than 30 minutes, making it a perfect weeknight meal. I love little time saving tricks, like adding the peas to the pasta water towards the end so they cook together. And, for some reason, I associate leeks with elegance. They’re one of those simple ingredients that have the power to transform an entire dish. Maybe because they’re like refined, more subtle onions with a more complex flavor. Be sure to stop by my blog, where this week’s blog hop theme is leeks! Despite being a weeknight dish, this pasta is also a tad indulgent with cream, ricotta and Parmesan. I’m a sucker for ricotta and would put it in everything if I could. Ricotta and arugula is a particularly alluring combination for me, which is why you’ll find the leafy green here as well, just tossed in at the end. I like orecchiette, those funny little pasta hats, for this recipe, but any shape would work. Don’t forget to reserve some of the cooking liquid for the sauce. It’s a trick my dad has taught me time and time again, and it makes a world of difference. The starch in the pasta water helps the sauce stick to the noodles, and makes the final product all the silkier and delicious. You can find Katherine at www.katherinemartinelli.com, as well as on Facebook and Twitter. Cook the pasta in a large pot of salted, rapidly boiling water until almost done. Add peas and cook for another few minutes. Reserve ½ cup cooking water, drain and set aside. Meanwhile, heat the oil and butter in a large saucepan over medium heat. Add the leeks, season with salt and pepper, and cook until soft, stirring often. Add the cream, Parmesan and a splash of the pasta liquid. Cook another 2 minutes. Add pasta and peas, ricotta, and lemon juice and zest. Toss to coat. Remove from heat and stir in the parsley and arugula. Season with additional salt and pepper and serve with grated Parmesan. Ha! If anyone is giving inspiration around here it is YOU! Still, this is such stinking fun. So, the real question is…are you going to come to Seattle for a visit or am I coming to Israel?! Hi Erina! I came over from Katherine’s blog. How nice to have a friend who is in the same field and inspires to each other. I’m going to check out your blog after writing this. Nice to meet you! Katherine, as always your dish is stunning and looks delish!! So nice to meet you! It is such a treasure to have Katherine to bounce ideas off of, albeit thousands of miles from each other. Technology has its merits! Hope you enjoy looking around Shut Up & Cook! Thanks Albert! Doesn’t this sound fantastic?! It’s such a great thing to maintain friendships with people you met in college and then both end up doing food blogs! So cool! First time for me here, so I see I have some surfing to do, but first I want to say what a fantastic pasta! I always reserve a little of the pasta water for the sauce, but to be honest, I never knew why. I just saw an Italian chef do once on my of my cooking shows. 🙂 Thanks for the clarification Katherine! Great post ladies! Welcome! So glad to have you. The pasta water trick is an oldie, but a goodie. Hope you enjoy exploring the blog! Katherine is quite lovely company to keep, so eager to check out your blog as well. Love meeting new bloggers — thanks for the introduction to Katherine! 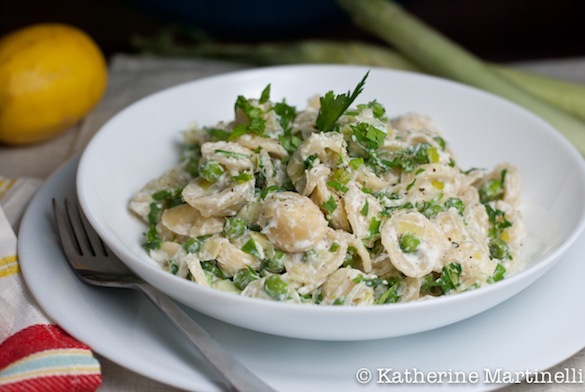 This pasta looks deliciously creamy and savory. I wish I had a big plate of it right now! Ann…you should absolutely know Katherine, and vice versa! Perhaps all the stars will align at some moment and we’ll end up on the same country and coast…in the meantime, we’ll settle on enjoying each other’s fabulous recipes. Love it! Love this dish Katherine. Great guest post! Isn’t she the best, Alyssa? The Katherine Martinelli is an extraordinary blogger and writer. Not to mention a darn good cook. Love the recipe – I kinda associate leeks with elegance or luxury too, which is a bit weird because at one time in Europe they were considered kinda peasant fare. Or so I understand; but I’m often wrong. 😉 Anyway, in this country they’re so expensive they are elegant fare. Which is what the recipe is all about. Truly good stuff – thanks. I couldn’t agree more John…she is positively the best. Lobster was also considered peasant fare at one point…so who knows! Thanks for stopping by. Any friend of The Katherine Martinelli’s is a friend of mine. Aw you girls are so sweet and cute:) You both have lovely blogs and delicious recipes. Best of luck and continued success to you both. Katherine the orecchiette sounds scrumptious. Thank you Nancy…it’s very fun to have a virtual blog penpal around the globe. Excited to go check yours out as well! What a fabulous guest post! Leeks are one of the only things left at my farmer’s market right now. I’ll stock up this weekend. Leeks are one of those culinary WonderBras if you ask me…everything is better with them! What a wonderful guest post! I love both of your blogs and find inspiration and delicious ideas every time I read each of them. It’s marvelous that you’ve known each other for so long and share a love of food. Katherine, this is a lovely pasta dish. My husband adores leeks, so I’m excited to check out the recipes on your blog hop. Thank you Hannah…hopefully some day we’ll all be on the same coast/country at the same time and can all get together! Katherine is developing quite the fan club here in Seattle! This looks delicious. Will one of you come to Hartford right now and make it for me? Or… should I MAKE IT MYSELF?! Can we Skype or something when you’re visiting Katherine this winter?! SO JEALOUS!! Leeks, ricotta, pasta? Sign me up PRONTO!! No doubt!! Is there anything better? !